Landscape Plants Articles | Fairway Green Inc.
Spring has arrived! With the warmer temperatures, flowers are starting to bloom bringing pops of color to landscapes. 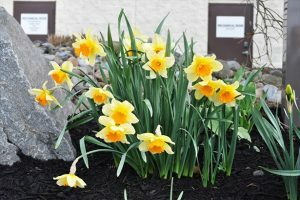 If you are interested in adding flowers to your landscape this spring, below we go through the most popular spring flowers seen in our area, how to plant them and the best suited locations for them. Crocus’s are the first to grow and can even grow through a late season snow. Crocus’s have cup-shaped petals and bloom in the colors of yellow, white, purple and lavender, or a combination of colors. These flowers should be planted in the fall before the ground freezes in full sun to partial shade and they prefer well drained areas. These plants grow from a “corm” which is like a bulb. A new corm will grow on top of the old corm each year and regrow the plant. The central corm has tiny corms called “cormels” around its base. Each one of these corms can grow an additional one to five plants. They should be planted two to three inches deep with the wide side down and any foliage towards the top. This plant will continuously grow each season unless conditions are unfavorable. Daffodils are currently blooming all over the New Jersey area. It is said that there are over 13,000 hybrids of daffodil which range in color from yellow, white, orange, lime green and pink. Daffodils are a perennial that have a trumpet-shaped center (called the corona) set against a six-petal star-shaped background (called the perianth). Sometimes the corona and the perianth are different colors. 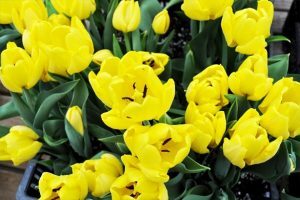 The bulbs should be planted in the fall, two to four weeks prior to the ground freezing at a depth of six inches or about 3 times as deep as the bulbs are wide. This time frame will give the bulb time to grow out its roots in a cooler climate. These plants are very versatile and can be planted in sun, partial shade and like well-drained soil. Fun fact about Daffodils is that deer do not like them! This makes a great flower to add to your property that you don’t have to worry about the deer eating. Tulips are another early annual plant that grows in the spring. Tulips have been cultivated for thousands of years and are native to Turkey. 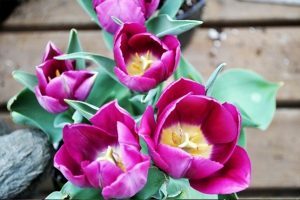 The have a cup-shaped appearance with three petals and come in a variety of different colors; such as yellow, white, red, orange, pink, purple, green and multicolored and the tulip bulbs should be planted in the fall. Tulips require full sun or partial sun and prefer well drained sandy soils. We recommend planting the bulbs six inches deep with the pointed end towards the surface of the soil and a few inches in between plantings. 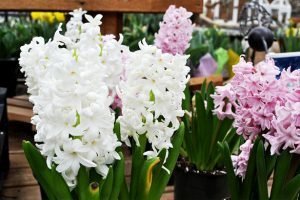 Hyacinths are a beautiful plant named after the Greek God. This plant grows from a bulb that we recommend you plant six inches deep with three-inch spacing between plants, at a minimum of one month before the ground freezes. This will give the roots enough time to develop prior to the winter. This type of plant comes in a wide variety of colors; such as white, pale pink and salmon pink, pale blue to blue and yellow. It usually grows to about seven inches tall with single or double flowers about an inch long. Usually a “spike” has about 100 flowers on it. Fun fact about this plant, it’s not just for show in a garden, it is also cultivated for its scent for making perfumes. Primrose is another beautiful plant that blooms in the spring. They typically grow about 12 inches long in well drained, soft, moist fertile soil. They have oval-shaped petals and grow in clumps. Primroses do well in partial shade; however, they do not flourish during the high heat of the summer. Make sure to cut the heads of the flowers off after bloom and water throughout the hot summer months. They come in a very wide variety of colors; such as cream, white, yellow, orange, purple, pink, blue and red. Often the center eye of the flower is a different color than the petals. Lilac is a beautiful, fragrant plant that blooms in the spring. Lilac ranges in height from 6 to 20 feet, while most commonly plants are in the 8 to 12-foot range. The petals are spade-shaped and grow in clusters. Their most common color is purple but can come in white, pink, magenta, yellow and blue. They produce a wonder fragrance that is attractive to bees and butterflies. Lilac should be planted in the fall or in the early spring and require about six hours of full sunlight a day. They should be planted a minimum of six feet apart in soil rich in organic matter. 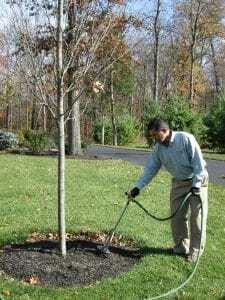 Light pruning (if needed) is recommended as heavy pruning and removal of wood will reduce spring bloom. There is a wide variety of flowers that bloom in the spring that can brighten up your landscape. 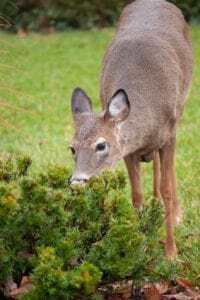 While planting spring bulbs largely is a task that falls under fall landscaping, there is still time to think about vibrant additions to shrub beds around your property. If you are in our service area and have questions about planting spring bulbs, please give our office a call, 908-281-7888.